Russia’s national payment card will come into operation by the end of the year, said Central Bank Deputy Chairman Olga Skorobogatova. It’s to ensure smooth electronic transactions in Russia hit by Western sanctions in 2014. The card will also operate abroad within a year, she said. “We plan that the national payment card will work in co-branding with four payment systems - Chinese UnionPay, Japan’s JCB and with international payment cards Visa and MasterCard,” Skorobogatova was cited as saying. She added that negotiations are underway with the countries of the Eurasian Economic Community, which are discussing options for cooperation of national payment systems. The first nationwide payment card is aimed to protect Russian cardholders and provide with constant payment transactions within the country. Outside the country it will be served by international systems, Skorobogatova said. 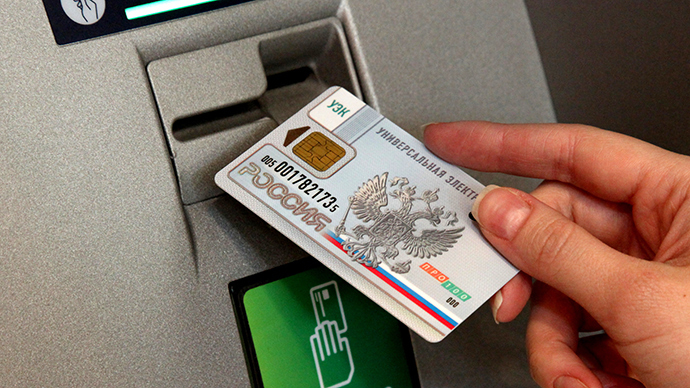 Some 210 million plastic bank cards have been already issued in Russia, far exceeding the population. By 2018, domestic cards will take 50-60 percent on the Russian market, according to the head of National Card Payment system Vladimir Komlev. Last year, Russian President Vladimir Putin signed a law to establish national payment card system (NPCS) after both Visa and MasterCard stopped servicing a number of Russian banks which came under US sanctions regarding Moscow’s position over the Ukraine crisis. Russian authorities also decided to establish a national payment card which would not operate only internally, but also abroad. Visa and MasterCard later signed an agreement to carry out card transactions via the NPCS processing center and settling through the Bank of Russia. Visa and MasterCard currently dominate the Russian market. In 2014, Visa’s market share in Russia reached 60 percent, whereas MasterCard’s was 35 percent.